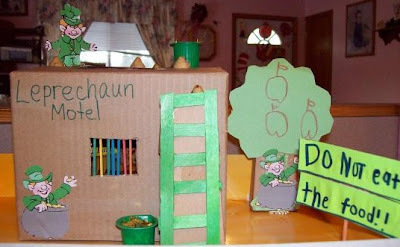 Being Frugal and Making It Work: Leprechaun Trap - Happy St. Patrick's Day! St. Patrick's Day is a special day for the first graders at my children's school. Each student is asked to create a leprechaun trap and return it to school the week before St. Patrick's Day, in hopes of catching a sneaky leprechaun or two! We were given a few hints before we started our project. Leprechauns are tricky little fellows - they like shiny things, things that glitter and sweets. They are also naughty at times and often disobey signs! 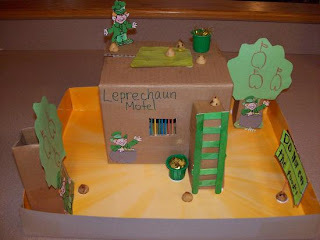 How our trap works: The Leprechaun will go around to gather up the chocolate chip cookie kisses, and when we goes to get the one on the rug at the top, he will fall through the hole that is hidden under the rug! Wow, your trap is so much cooler than ours, lol! My 5 year old daughter has been talking NONSTOP about leprechauns for weeks now. They made a trap at school and she thought it was the coolest thing ever, so we made one at home as well. And every time something is messy or something goes missing, she has been blaming it on leprechauns, lol!